When you have your mind set on a certain goal or adventure, you want to make sure your watch can also go the distance. With up to 120 hours of continuous exercise tracking, the Suunto 9 is built to last – just like you! Suunto 9 is a multisport GPS watch designed for athletes who demand the best. Its intelligent battery life management system with smart reminders ensures your watch will last just as long as you need it to. The robust Suunto 9 is made for long, arduous training and racing and extreme adventures. Suunto Fusedtrack™ For More Accurate Track And Distance: On long ultra runs, battery life is often the limiting factor for recording distance and track accurately, as GPS is a heavy drain on the battery. Suunto’s unique FusedTrack™ algorithm combines GPS and motion sensor data to improve track and distance accuracy. This allows you to extend battery life by lowering GPS power without significantly compromising accuracy. Thousands Of Hours Testing In The Toughest Conditions: The Suunto 9 is designed and built to meet the demands of professional athletes. Tested to the extreme with thousands of hours of real use in the toughest conditions by Suunto’s internal testing team and athletes all over the world, it is your trusted companion to confidently see you through any adventure! Never Worry About Running Out Of Battery: Three predefined battery modes – Performance, Endurance and Ultra – deliver from 25 hours to up to 120 hours* of recording time with GPS tracking on. When you start a recording, you’ll get an estimate of how much battery you have left with the current mode. If it’s not enough, switch to another mode at any time. The Suunto 9 uses smart reminders based on your activity history, to help ensure you are fully charged for your next outing. If the watch notices you are running low on battery during an exercise, it will automatically suggest changing to a different battery mode. Share Your Passion With Suunto App: Pair Suunto 9 with the new Suunto app to track all your adventures, as well as follow your long term trends, including daily activity and sleep. Easily share your greatest achievements and connect with others in the app community. The smart mobile connection keeps you on top of your daily business with incoming call alerts, messages, and notifications to your watch. 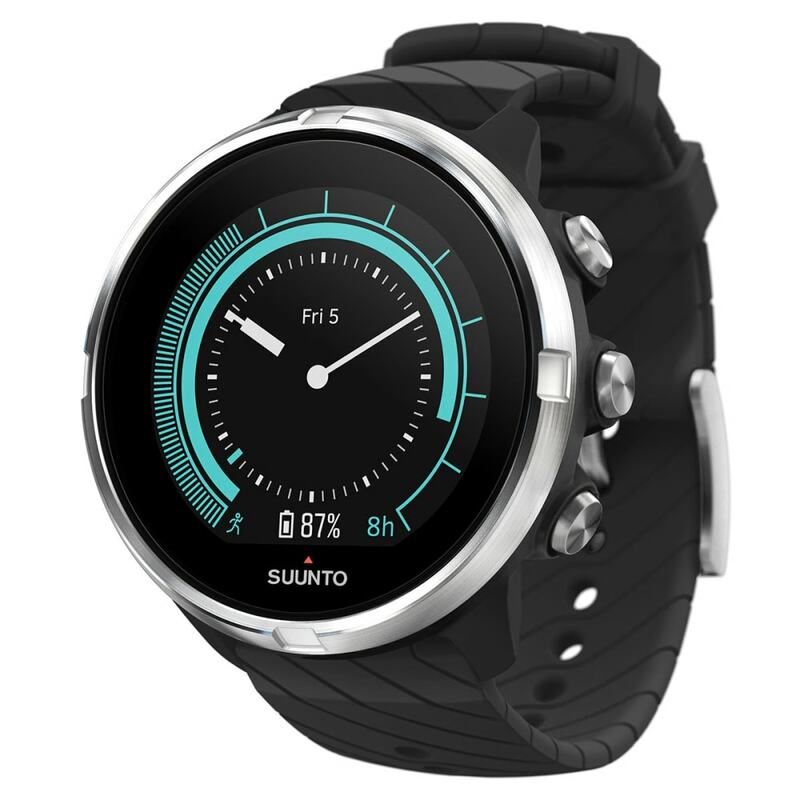 Suunto app is available in the App Store and Google Play. Measurements: 50 x 50 x 16.5 mm / 1.97 x 1.97 x 0.65"
Weight: 72 g / 2.54 oz. Weight w/ Batteries: 2.54 oz.